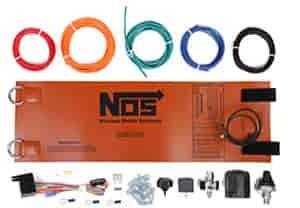 To get peak performance from your NOS system it's a well known fact that nitrous bottle pressure plays an important role. If your bottle pressure is too low, your nitrous system tune up will be too rich and have less than desired results. Too much bottle pressure and you may be getting into a lean tune up, unable to activate the nitrous solenoids or in a worst case senario run into safety issues with the bottle itself! Note:To achieve maximum performance we recommend an NOS Electric Bottle Heater.